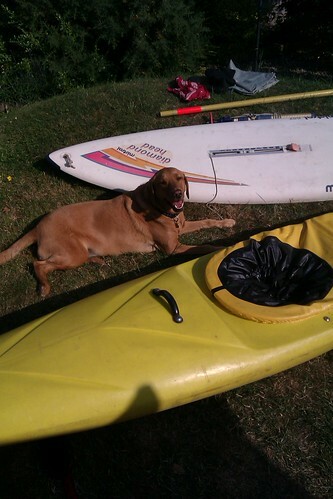 It turns out that Molly, who woofs manically whenever there’s anything new going on in the garden (or, indeed, anywhere in the broad vicinity of the house) is bizarrely at ease among kayaks and windsurfing boards. At one point, I’d rolled the kayak onto its side to clean the bottom. I looked around to see where Molly had disappeared to and found her stretched out along the underside of the ‘yak. Fast asleep. Molly the water dog. Definitely a hound after my own heart. This entry was posted in Dogs, Photography and tagged Dogs, Molly, Photography, Watersports by Simon Perks. Bookmark the permalink.